When I started The Pin Junkie a year ago, I never would have guessed how much I enjoyed blogging about doing Pinterest projects! 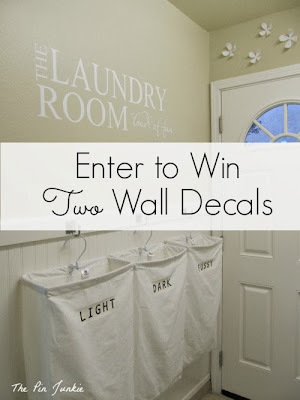 I love all things Pinterest: the creativity, the inspiration, the solutions to everyday household problems, and the hilariously funny pins that make me laugh out loud. I've certainly learned a lot this year! I've learned a LOT about blogging, but I've also learned many other things like how to paint something without leaving brush marks, how to make simple wood projects, how to make a bunch of new recipes, and how to take better pictures. I even learned how to use Facebook. Can you believe I'd never used Facebook until a year ago! 1. Blogging will consume your life! If takes up a lot of time, and it seems like there is always one more thing to do whether it's putting the finishing touches on a post, answering blog comments and email, networking, or updating social media accounts. Oh yeah, and actually doing the projects! 2. Bloggers are some of the most creative and nicest people around! The people I've met online have been truly wonderful, kind, gracious, and friendly. People have left some very kind and encouraging comments (I love reading comments so keep 'em coming!) Many bloggers have been kind to answer my questions and allow me guest post on their blogs. When I first started blogging a year ago, I was so worried about what people would think and about receiving negative comments. I've been so blessed to get many positive comments and feedback and very I'm grateful! 3. People who aren't bloggers don't necessarily understand or appreciate what bloggers do. Honestly, this is mostly my family and friends who think I'm completely crazy! 4. It doesn't have to be perfect. I've always been a perfectionist. I like things to be just right. Often when there's a deadline, I've had to learn to overlook some little imperfection and just move on. 5. It's ok to make mistakes and I've certainly made a few. I made a recipe for slow cooker Swiss chicken that was terrible! I made a recipe for blueberry breakfast cake and forgot to add the sugar. If you look close enough, you might even find a typo or spelling mistake here and there! 6. I knew I loved Pinterest, but I'm am absolutely surprised at how much I enjoy blogging! It really motivates me to actually do the things I pin. There's always something new to learn and it's never boring. Everyday I'm working on something different and I really enjoy it! 7. It's often surprising what projects and posts appeal to readers. Sometimes I can spend hours or days on a project or writing the post to get it just right and people just don't seem interested at all. Other times, a project or a post will come together really quickly, people are really interested and it generates a lot of comments and views. 8. Bloggers are some really amazing people! They're knowledgeable about marketing, networking, coding, photography, and their particular area of expertise. They often do all this while doing something else on the side like raising a family or working at another job! I'm really looking forward to another fun filled, Pinterest packed year of trying new things! I hope you'll join me! 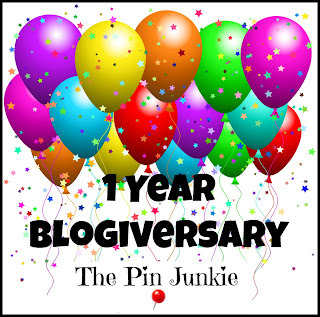 And don't forget to enter the Pin Junkie Blogiversary Giveaway! Great post! I've been blogging for 3 years and have learned so much but I have so much more to learn. Congrats on 1 year! Thanks Becky! There's always something new to learn about blogging! That's one of the things I love about it!